The stunning new thriller from the bestselling author of Velocity and Relentless. In the Colorado mountains something miraculous comes into the life of Grady Adams, a strong, gentle man whose past experiences have alienated him from the modern world and driven him to live in the wilds. When he sees it, he knows that one of Nature’s great mysteries has been revealed to him. He takes his friend Cammy Rivers to bear witness to the phenomenal presence. As a scientist, she is stunned and awed. She emails photos to colleagues in far places to try and find a name for the wonderful beings. Before they know what is happening, Homeland Security has quarantined the wilderness around them and sent in assorted scientists to track down and ‘neutralize’ the threat to the known world. 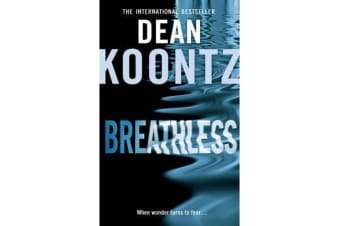 Grady and Cammy aren’t sticking around to be mere witnesses to this atrocity – determined to prevent it, they go on the run, and a pursuit of hair-raising suspense is under way, with no happy ending in prospect… Breathless is a unique and riveting thriller from the master of suspense.